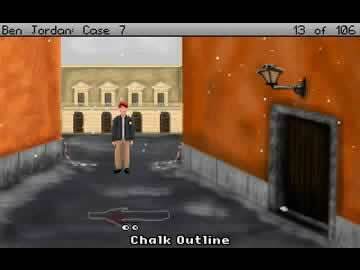 Ben Jordan - Paranormal Investigator Game Review - Download and Play Free Version! Put on your investigator's cap and help Ben Jordan solve another case of the paranormal! Amusing story line and plot details. Graphics are not the least bit remarkable. Sometimes difficult to know what items in a scene must be added to inventory. Some content more appropriate for an adult audience. It was brought to our attention that this game contains some contain that is questionable for younger players. 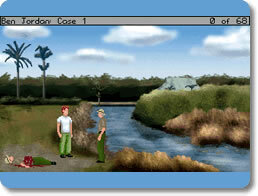 With seven different cases already available as separate games, as well as an eighth on the way, this freeware hearkens back to adventure games of old that were known for their extreme level of difficulty and humorous dialogue. In fact, the most apparent negative aspect of this game is that it may be rather difficult at times to discern which items in a location must be added to the inventory and missing obtaining a key object could tragically hurt you at a later point in the game. Adventure enthusiasts will enjoy this aspect as it truly adds to the adventure of the game, producing different results according to which actions are taken previously and which objects are collected. Dialogue is particularly amusing, including a sarcastic narrator, crazed environmentalist protester, and somewhat fatalistic receptionist and park ranger. It is worth noting that some dialogue, particularly a conversation between Ben and aforementioned park ranger, is of a suggestive nature and is not be suitable for children. Furthermore, the conclusion to the game explicitly deals with drugs and parents should be warned of this content. Background music varies by location, often changing with each new area entered. The music itself typically has a good beat and adds to the overall ambiance of the game. The plot is intriguing and takes a new take on investigations into the paranormal. Don't expect Bill Murray to bust in wearing full Ghostbusters attire as Ben Jordan is a professional in an odd career, but his snarly sense of humor and host of peculiar cases will keep you entertained for hours. Graphics were a bit behind the times even at their release date, but the picture is always fully visible with enough clarity that the quality of the game is not severely diminished by this production aspect. Each of the seven different cases is linked together by a common over arching plot that is slowly revealed in each release, including searching for a Lost Galleon, battling with a sorceress, and conquering the living dead! 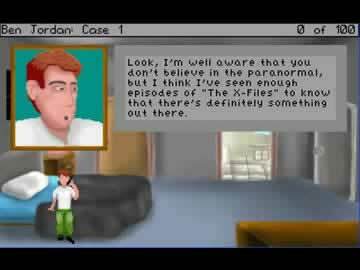 Ben Jordan – Paranormal Investigator is most highly recommended to avid adventure gamers who will enjoy the challenge presented through object location difficulty but due to the game's content, not recommended for younger players.